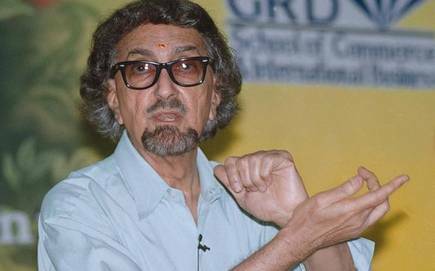 To call AlyquePadamsee a legend would be utilizing a cliché. But, no other word can do him justice. Even ‘icon’ will not do given his talent that took many roles. He belonged to an era that still produced versatile geniuses who straddled multiple fields with equal élan. And creativity ran in his genes: he was the brother of Akbar Padamsee, the well-known painter. As youngsters, even before we entered the corporate world, we knew of him for his women. As a theatre personality, he had the aura of some of the Broadway greats like Arthur Miller, who was married to Marilyn Monroe. Maybe, I had created that image of him since I first saw him performing in Miller’s play – Death of a Salesman. It was Alyque’s own production, which cast his long-time partner Dolly Thakore as Linda Loman and Sabira Merchant as his muse and mistress. Alyque was above all a showman. As a rookie Manager, I have seen him sell campaign ideas to hard-as-coconut marketing doyens like Shunu Sen only to crack them up and get to the malai inside (winning the account that is). Therefore, it is easy to imagine how he would have presented the idea of the girl in the waterfall for Liril, the BacchetohBaccheBaap-re-Baap mother of Dalda Refined Oil or the classic Lalita-ji of Surf. Less people know Alyque was the creator of the “unputdownable” campaign for the launch of The Telegraph together with Aveek Sarkar and, yes, MJ Akbar. It was arguably the first newspaper to be marketed in the country and made the maiden use of television way back in 1982. But beneath his aura of a creative genius, Alyque was a sharp businessman. He was probably the first Creative Head to also become the CEO of a large agency. It’s no wonder he took Lintas to be among the Top 3 agencies in the country after his predecessor, friend and mentor Gerson Da Cunha handed over the baton to him in the early eighties. Probably that was the Khoja trait in him. For us clients, Lintas Accounts Executives were all clones of Shylock. Unlike other mostly laid-back agencies, they never compromised on the rate card or relented on the due dates of bills. Therefore, it was easy to identify him as the hard-negotiating Jinnah in Richard Attenborough’s Gandhi. Though Alyque has been celebrated as one of the advertising greats in the league of Subhas Ghoshal (of J Walter Thompson) and Sylvester Da Cunha, his contribution to English theatre was probably more significant. His subsequent productions such as Othello and Tughlaq (when he launched actors like Kabir Bedi and DalipTahil) or the musical Evita with Sharon Prabhakar (whom he married later) would be remembered as major milestones of the Indian theatre landscape. Alyque lived just off Breach Candy. A quintessential SoBo (South Bombay) celebrity, Alyque was much on demand in the cocktail circuit. But, as far as I remember he was a teetotaller who stuck to his Coke or Soda. His Juhu house was the place to be for Mumbai’s advertising and marketing crowd. Getting an invite would mean coming of age for many wannabes. Folklore has it that it was Alyque who introduced Peter and Indrani Mukherjee in Mumbai, over a drink with their common buddy Suhel Seth. Personalities like Alyque do not fade away easily. Even after stepping down from Lintas he continued to be an advisor to many companies. People who interacted with him in later years did not find him an easy man to deal with both personally and professionally. Alyque made the occasional appearance on television as an ‘eminent citizen’ or ‘ad guru’. Sometimes with a not-so-popular viewpoint like when he tried to defend TarunTejpal after the controversy. One would have loved to hear his views on #MeToo. But, perhaps, he was not well enough to come on camera. However, theatre remained his abiding love. One of his last productions that I saw was Broken Mirror – an English rendition of Girish Karnad’s famous Kannada play – BhikreBimb, starring Shabana Aazmi in a stellar solo performance. One does not know too much about his personal life except that it was complicated. Not everyone would say he was a nice man to know. Was he happy at the end? Or, did Alyque see a reflection of him in that cracked mirror one will never know? But, he did live a full life and world will remember him for his work. Is Graham Reid set to become the new coach of Indian men’s hockey team?